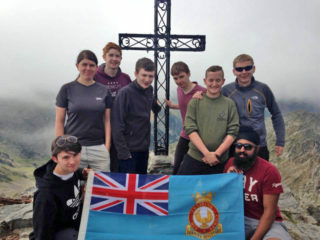 A team of nine cadets and staff from 2344 (Longbenton) Squadron have succeeded in climbing their first foreign peak – the Pic Du Canigou in France. Flight Lieutenant Will Close-Ash, who famously assisted in rescuing a group of Belgian climbers on the peak in 2008, was leading the team. The group of seven cadets and two staff members spent the first few days in the French Pyrenees preparing for the 2784m ascent. They undertook an 11km walk on day one and enjoyed the local surrounds of Ville France and markets in Prade as they made their way to the base of the Canigou. The ambitious team awoke at 6:30 AM after spending four days to build their fitness and acclimatise for the 12 hour round expedition. Their reward on reaching the summit was stunning views. Day six saw the team conquer Rock Colom – 2500m high. Officer Commanding, Flight Lieutenant Gary Richardson said; “Expeditioning develops a range of skills and qualities which are not easily replicated in the classroom. These skills range from ‘hard skills’ such as campcraft, navigation and leadership to ‘soft skills’ such as determination, team work and humility. There is no app which will get you to the top of a mountain; only your legs, lungs and determination can do that. Our young people have enjoyed an incredible opportunity which has broadened their minds and shown they can be self-reliant in a mountain environment.” “I must also thank the Ulysses Trust and the RAF Charitable Trust for their generosity in supporting this opportunity,” added Gary. The team spent the last two days of their expedition in Perpignan and Barcelona before returning to Tyneside.